Your garden needs to be a place where you can feel at home and be yourself but you may need it to be diverse in its use. 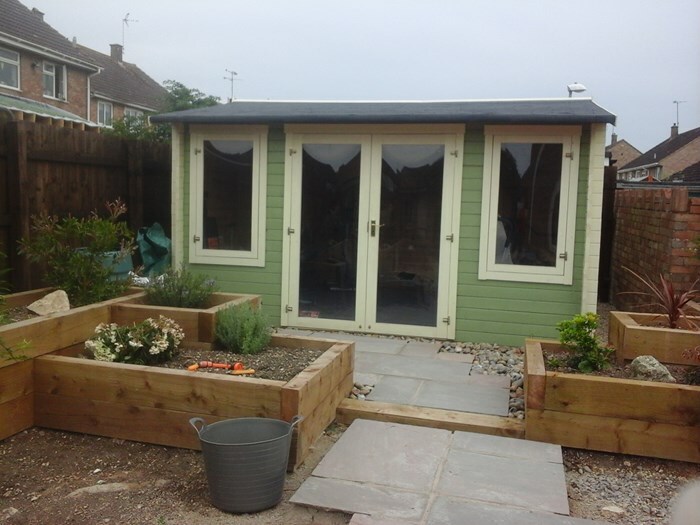 An outdoor garden building is one of the best ways to expand on your living space without moving house or investing in costly house extensions. 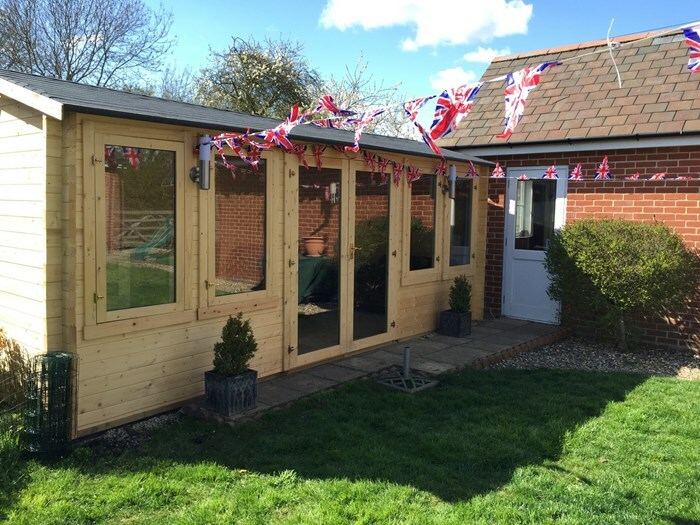 The Dorset Log Cabin is a garden building you’ll be proud of for many years to come. The building features a traditional log cabin wall construction and a choice of Georgian or Modern style windows. The doors are centrally placed which give the cabin a balanced look. This log cabin can become the centre of your outdoor space and give character and substance as well as fulfil your life. 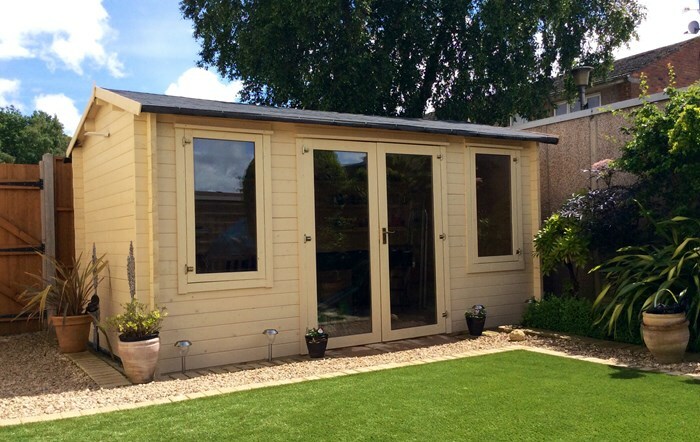 An outdoor building is one of the best ways to extend your home space without going through the expense of planning for and building an extension. 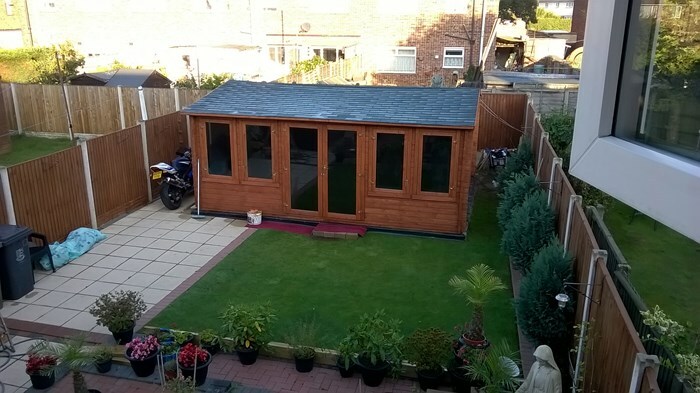 With your Dorset Log Cabin you can select 28mm, 35mm , 44mm or 70mm thick walls depending on your requirements for strength and durability. Other factors you may wish to consider are if you require weather protection and higher levels of comfort. We also offer you options when customising the appearance of the cabin. The Dorset Log Cabin features a side window and you can actually decide where you would like it, on the back or side so you can maximise light or make the cabin more private. 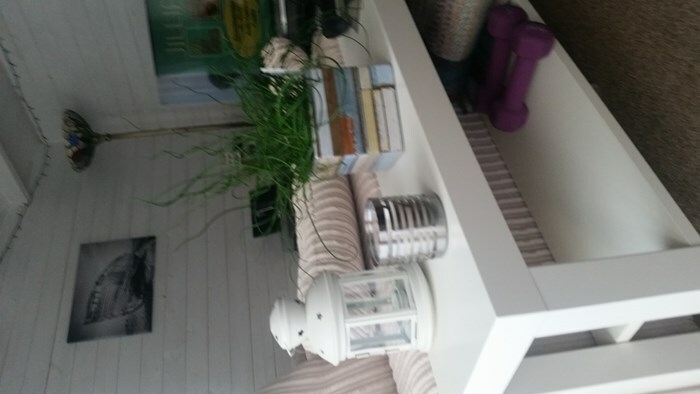 A Dorset Log Cabin could be your new gym where you can work out in piece or practice your martial art skills in privacy. 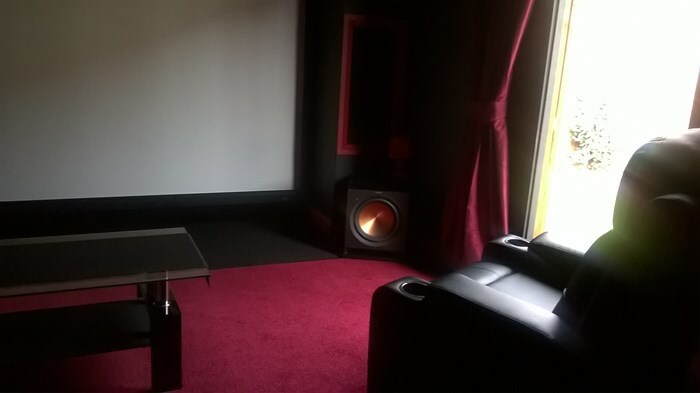 The thicker flooring and wall options will ensure this place will stand up to heavy use. 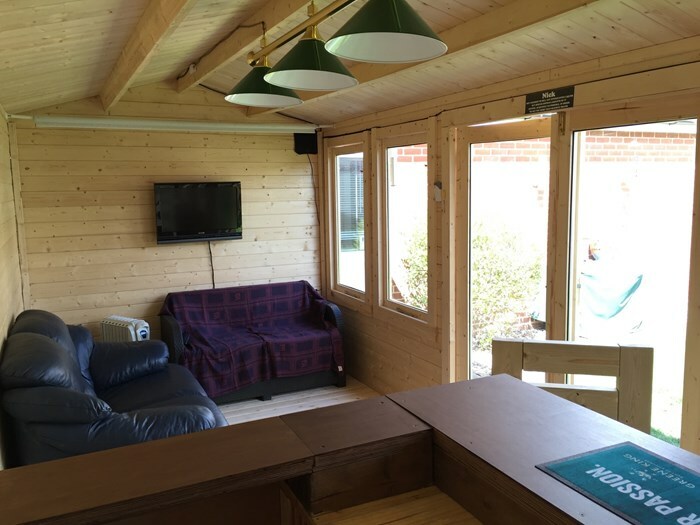 The uses for a log cabin are endless, it could be your new office to save you commuting to work, or it could be a spare guest room, whatever your needs, the Dorset Log Cabin is the answer. You won’t be limited with ideas for extending your living space, this log cabin can be as versatile as you need it to be. The cabin could be a games room where you can pursue your passions or an extra bedroom for when your extended family come to visit. The interior has been designed to ensure your comfort, there’s extra high double doors that mean you can fit in all of your pieces of furniture with ease. The extra high ceiling also means your tallest guests don’t have to worry about hunching over. The construction is strong and solid so you can be totally confident your items stay secure. This building space is big enough for your needs whatever they may be, with options such as heavy duty floors and roofs this cabin will meet your high expectations and demands. 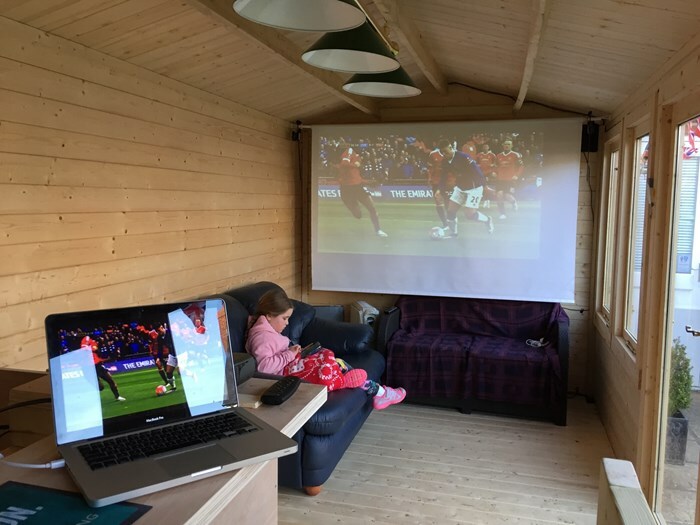 If you’re yearning for your own space, or are desperately sick of that long, tiring commute to work and want to set up your own office, then the Dorset Log Cabin is the answer. 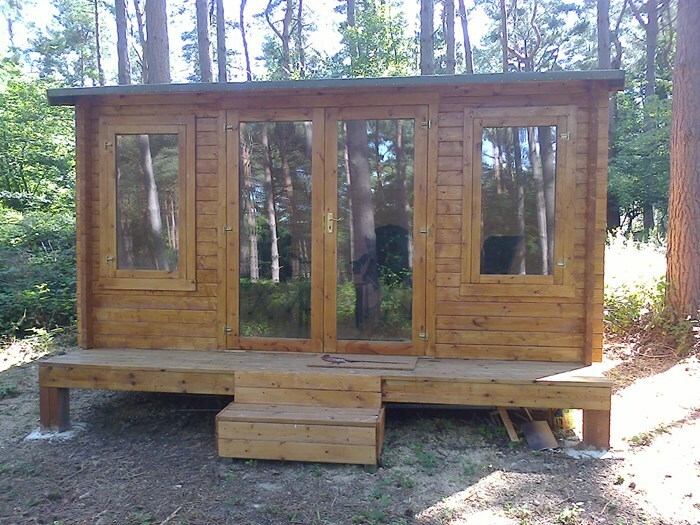 We don’t do a one size fits all approach, we can offer you the options of size and finish to ensure your log cabin will be exactly what you want and need. 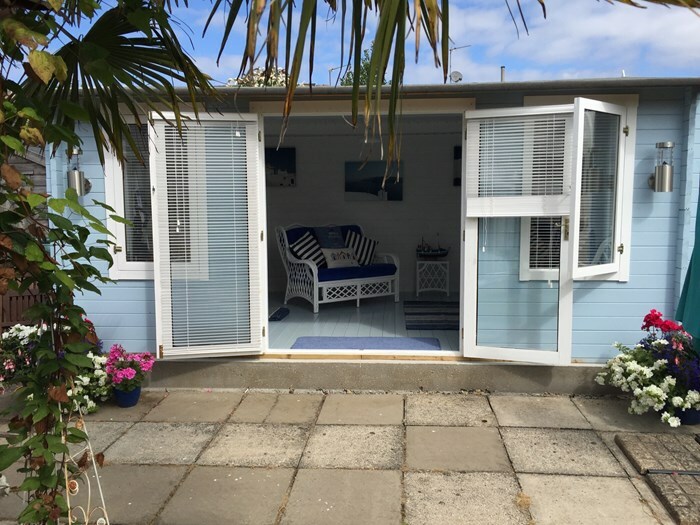 If you’re yearning for a summer house for the warm summer months, we recommend that you look at thinner wall and floor options if you only need your cabin for seasonal use. Many people dream of owning their own private gym and the a Log cabin will make that a reality. The thicker flooring and walling options will ensure your cabin is good for year long usage and can stand up to the impact of heavy furniture or equipment. Whether you’re looking to use your cabin for the warmer months or for year long use we offer a range of extras and upgrades to help your cabin last for years. The 28mm thick walls are ideal for seasonal and semi regular use but the 35mm and 44mm walls retain more warmth and offer better weather protection. The boards interlock like traditional log cabin design, keeping the elements out. We offer the standard 11mm or 19mm thick roof option, the thicker roof option goes will with the shingles option which is the premium weatherproofing option we offer. For ultimate weather protection, you can also opt for a pressure treated building. We offer pressure treatment as an effective way of keeping a building protected from the harsh elements. 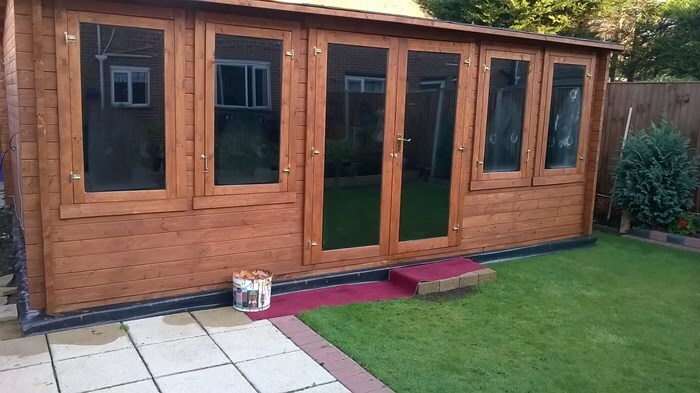 The pressure treatment penetrates the wood providing you with a low maintenance building which doesn’t require any treatment from you at home. This option is especially great for anyone who is looking for a building which doesn’t require any effort to look great all year round. Now you’ve decided on your flooring and roof options the next step is to consider the style and material of your doors and windows. The type of finish is down to your personal taste so we offers two different finishes. The Georgian style finish on the windows and doors is a pleasantly traditional design that will ensure your log cabin will fit in with your traditional garden surroundings. If you’re a fan of a contemporary look our Modern style windows and doors will keep your log cabin looking fresh. The 6’2” high doors also make it easy to get taller pieces of furniture in and out of the cabin. The finishing touches will make your Dorset Log Cabin really stand out and look the part, we offer a range of weather proofing finishes and paint finishes so you can make your cabin truly personal. Weatherproofing finishes will help keep your cabin in tip top condition so you can get continual enjoyment for years to come. You can select a range of coloured shingles to contrast or complement the colour of your cabin. You can opt to have a weather proofing finish on the cabin that will keep its natural tones looking good or you can make a statement by selecting a premium paint. We do advise that you annually treat your building to ensure it’s remains well protected from the elements and will last you for years. Treatment is available in four colours: Evergreen, Cedar Red, Harvest Gold and Dark Brown. Our premium paint comes in a wide variety of colours to help bring your cabin to life. The Dorset has extra high doors which ensure extra clearance for taller people and taller items like furniture. The eaves of the roof (the lowest point of the roof) have also been raised which allows for a higher ceiling. The windowed door and side windows also ensure lots of natural light will keep the interior looking bright and spacious so you won’t be reaching for the light switch. The Dorset has an overall height of just below 2.5m will means you won’t have to apply for planning permission. 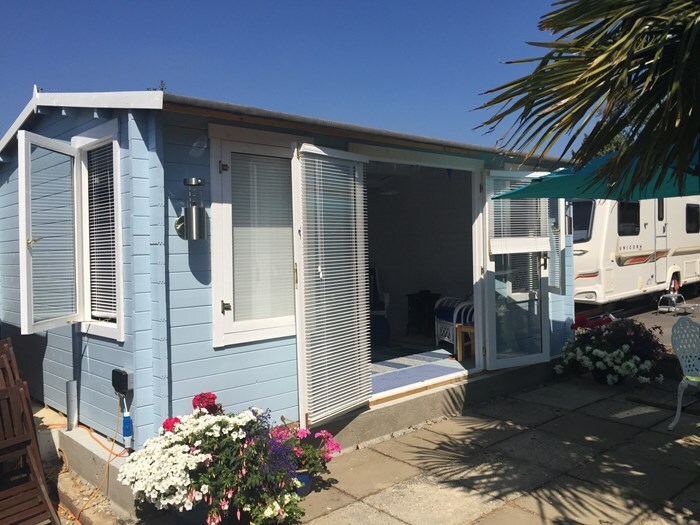 Before you purchase a cabin with us we do recommend that you get in touch with your local council for more information on building restrictions and regulations in your borough. 19mm roof which is stronger, this material is ideal with the shingles roof covering option. Width 415.2cm 13'7" 445.2cm 14'7" 505.2cm 16'7" 415.2cm 13'7" 445.2cm 14'7" 505.2cm 16'7" 508.4cm 16'8" 415.2cm 13'7" 445.2cm 14'7" 505.2cm 16'7" 508.4cm 16'8" 565.2cm 18'7" 565.2cm 18'7" 568.4cm 18'8" 565.2cm 18'7" 568.4cm 18'8"
Depth 282cm 9'3" 282cm 9'3" 282cm 9'3" 404.2cm 13'3" 404.2cm 13'3" 404.2cm 13'3" 391.7cm 12'10" 465.9cm 15'3" 465.9cm 15'3" 465.9cm 15'3" 465.9cm 15'3" 282cm 9'3" 404.2cm 13'3" 391.7cm 12'10" 465.9cm 15'3" 465.9cm 15'3"
Eaves Height (Inc Floor) 209cm 6'10" 209cm 6'10" 209cm 6'10" 209cm 6'10" 209cm 6'10" 209cm 6'10" 203.4cm 6'8" 209cm 6'10" 209cm 6'10" 209cm 6'10" 204.8cm 6'9" 209cm 6'10" 209cm 6'10" 203.4cm 6'8" 209cm 6'10" 204.8cm 6'9"
Ridge Height (Inc Floor) 247cm 8'1" 247cm 8'1" 247cm 8'1" 247cm 8'1" 247cm 8'1" 247cm 8'1" 249cm 8'2" 247cm 8'1" 247cm 8'1" 247cm 8'1" 249cm 8'2" 247cm 8'1" 247cm 8'1" 249cm 8'2" 247cm 8'1" 249cm 8'2"
Door Opening Size (w x h) 156cm x 187.6cm 5'1" x 6'2" 156cm x 187.6cm 5'1" x 6'2" 156cm x 187.6cm 5'1" x 6'2" 156cm x 187.6cm 5'1" x 6'2" 156cm x 187.6cm 5'1" x 6'2" 156cm x 187.6cm 5'1" x 6'2" 156cm x 187.6cm 5'1" x 6'2" 156cm x 187.6cm 5'1" x 6'2" 156cm x 187.6cm 5'1" x 6'2" 156cm x 187.6cm 5'1" x 6'2" 156cm x 187.6cm 5'1" x 6'2" 156cm x 187.6cm 5'1" x 6'2" 156cm x 187.6cm 5'1" x 6'2" 156cm x 187.6cm 5'1" x 6'2" 156cm x 187.6cm 5'1" x 6'2" 156cm x 187.6cm 5'1" x 6'2"
Width (Internal) 383.4cm 12'7" 413.4cm 13'7" 473.4cm 15'6" 383.4cm 12'7" 413.4cm 13'7" 473.4cm 15'6" 468.2cm 15'4" 383.4cm 12'7" 413.4cm 13'7" 473.4cm 15'6" 468.2cm 15'4" 533.4cm 17'6" 533.4cm 17'6" 528.2cm 17'4" 533.4cm 17'6" 528.2cm 17'4"
Depth (Internal) 233.4cm 7'8" 233.4cm 7'8" 233.4cm 7'8" 323.4cm 10'7" 323.4cm 10'7" 323.4cm 10'7" 318.2cm 10'5" 413.4cm 13'7" 413.4cm 13'7" 413.4cm 13'7" 408.2cm 13'5" 233.4cm 7'8" 323.4cm 10'7" 318.2cm 10'5" 413.4cm 13'7" 408.2cm 13'5"